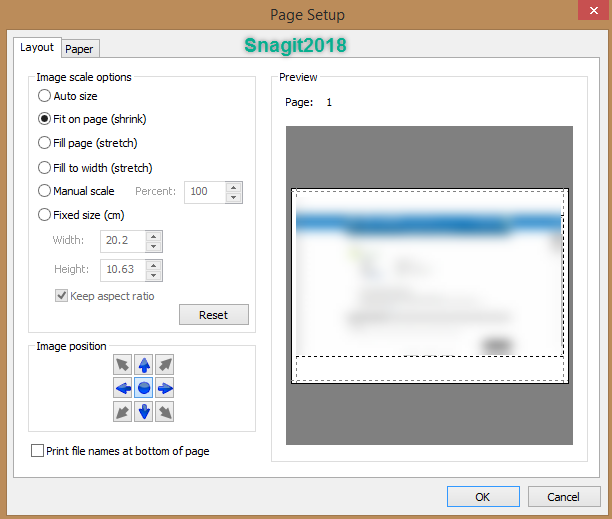 Images captured in Snagit 2019 as .png files are not being printed in the same size as they are in the source I'm copying them from. could it be the page set up on the newer version is not set the same as your previous version? Screen shot captured at screen resolution (72 or, at best 96 dpi) vs. original image at 300 dpi? My guess, the original image is 300 dpi but the resolution on screen is much lower and that is what SnagIt captures. Try changing image size from the 'Image' menu 'Resize Image' then expand the 'Advanced' arrow under the 'units' then select the resolution you want and 'Use resampling' and see what happens. My experience has been that the quality of the image degrades somewhat. In addition to what others have offered, try clicking the Resize Image option at the bottom of SnagIt and you can change to show inches. Maybe that will help. This only changes the values displayed in the popup. The actual values contained within would need to be changed. I note that the image in the editor actually changes as you change the values. And really, as I understand things, that's the purpose of this option, no? I know I've used it quite successfully to produce a printed template I used to create a custom decal for my vehicle.